The following is an unprompted, personal story from SPEAR Rehab Tech, Donald Zerio. 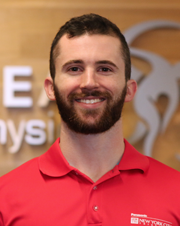 His personal industry challenges are not different than many others within the industry, and his plight provides inspiration to the young, future Physical Therapist. People search for the right physical therapy clinic for different reasons. As a patient, you choose SPEAR for a company that is going to offer you the best clinical expertise to alleviate your pain. As an employee, you look to SPEAR to give you the opportunity to display your strengths as a practitioner and build your professional reputation. My reason for choosing this company is a bit different, for I am not a patient or a physical therapist (yet!). I found SPEAR after my first year of getting rejected from PT schools. I needed more exposure in the field – working under a licensed therapist, being hands-on with patients, and interacting with other medical professionals. After a year, I applied to PT programs again, this time to more schools, with confidence that I would make it this time. Again, I faced rejection from every school. It was a hard pill to swallow. To be honest, I thought of giving up at that point. “Maybe I’m not cut out for this,” I thought to myself. It was a time in my life where I felt confused with what my professional purpose was. At the time, however, I did not realize how lucky I was to be in the position I was in – even though I wasn’t in school as soon as I wanted to be, I still had SPEAR. I don’t mean just the company and everything I’ve learned from working here, but rather the strong support system I have from my coworkers. With their friendship, encouragement, and constant optimism, I won the battle of my discouraging internal thoughts and kept pushing forward. Fast forward to today, and I’ve worked at both the 84th and 56th street offices for almost 4 years. And after my fifth time applying, I am three months away from starting the Doctorate program at the University of St. Augustine in Miami. In retrospect, I wouldn’t have chosen another path to get where I am today. SPEAR has matured me in ways I couldn’t have matured on my own – it has taught me qualities such as passion, empathy, leadership, and integrity which are integral to this profession. Even more, I’ve made some amazing friends within the company along the way. So if there is anyone out there that is in a similar position I was in, some words of advice: don’t give up on what you love to do. Find a place like SPEAR (if not SPEAR itself!) that is going to support you, motivate you, play to your strengths and improve your weaknesses. Thank you, SPEAR, for I am more than ready to succeed. Onward and upward!